It’s time to consider sanitation practices that can help reduce over wintering scab inoculum. These practices should be considered an essential part of apple IPM programs. Apple Scab Control with Urea. In 2014 scab was once again a problem in most orchards we scouted. Even if you didn’t see scab on the fruit at harvest there still could be infected leaves in the orchard at low levels. 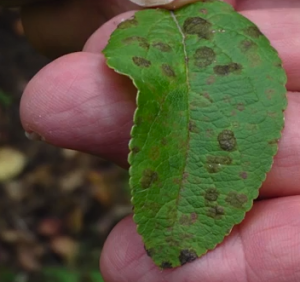 In addition, in the northeast and other regions scab is becoming increasingly resistant to chemistries we rely upon for primary season control. Therefore, all growers should consider integrating sanitation practices into their scab control program. The recommended sanitation program involves either: fall or spring applications of Urea; flail mowing fallen leaves; or preferably both. For a refresher we’ve linked a short video explaining this approach.